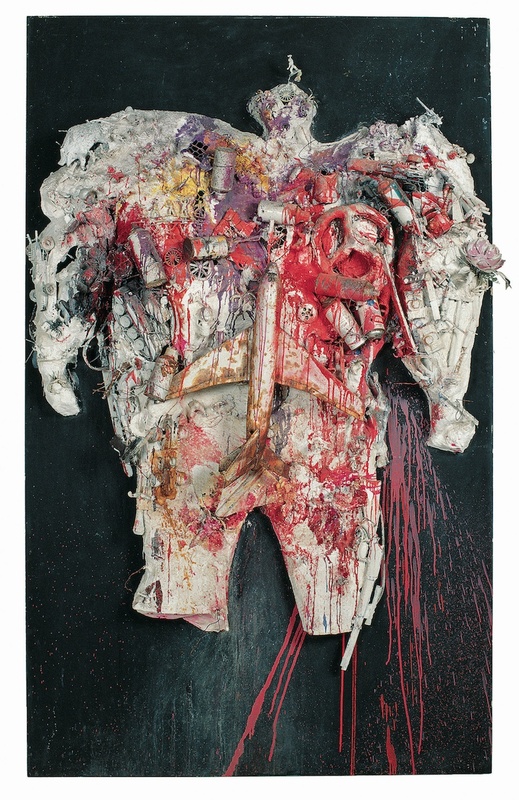 Niki de Saint Phalle’s Death of a Patriarch was made for one purpose: to be shot with a rifle. Saint Phalle, a famous Franco-American artist known for her deconstructionist, anarchist, and often performative art, first became famous in the early 1960s for her Tirs (“Shooting”) paintings. She would create plaster sculptures embedded with odd items such as knives, scissors, egg beaters, baby doll arms, anything she could find that reminded her of the patriarchal roles she felt subjected to. Integral to all of this were bags filled with paint (and occasionally tomatoes), which she would fire at with a .22 caliber rifle, causing the paint to splatter. Sweet, sweet catharsis. If you were lucky enough to live in France at the time, you could’ve seen this whole thing go down live. She often made a performance out of it and invited artist friends Robert Rauschenberg and Jasper Johns to participate. The whole project may have originally been conceived of after Saint Phalle, then still married to American writer Harry Mathews, was released from a psychiatric hospital and began experimenting with collage and paint. She overheard Joan Mitchell snobbily refer to her as “one of those writer wives that paint” and completely lost it. She left her husband and sought to symbolically destroy her patriarchal roles as wife and mother by literally shooting them with a freakin’ rifle. One of those writer wives, she was not. Death of a Patriarch was created in 1972, a callback to those Tirs paintings that had dominated her early career in the ‘60s. For Saint Phalle, the sculpture is meant to represent the archetypal, authoritative patriarch. Particularly poignant complements to this piece are the hilariously small head, the large and phallic toy airplane, and the exploded, bloody heart (made from a peace-sign-shaped cast iron pump normally used to regulate waterflow, interestingly enough). Also notable are the racing cars, tank, geometry instruments, and many, many guns. I would call this symbolism a little “on the nose” if Saint Phalle weren’t so likely to shoot that nose clean off the work’s face. Death of a Patriarch is the work of an obviously passionate and political artist, but it is very personal too. Saint Phalle revealed decades later sexual abuse she had experienced at the hands of her own father. This could be part of what makes Death of a Patriarch so powerful and horrifying. It serves as both a local and global vehicle for Saint Phalle’s own aggression and trauma. Saint Phalle also joined the Nouveau Réalisme movement, led by a bunch of cool, hip “avant-gardists” (love that pun) in the spirit of the earlier Dada movement bent towards deconstruction and anarchistic work. Their whole deal was messing things up because society and conventions were, for them, powerful tools of oppression. In that sense, Death of a Patriarch could easily serve as a representative piece for all that the movement stood for. The Art Story Editors. “Niki de Saint Phalle.” www.theartstory.com. Accessed November 15, 2017. http://www.theartstory.org/artist-de-saint-phalle-niki.htm. Brutsche, Paul. “NIKI DE SAINT PHALLE: a Psychological Approach to Her Artwork and the Symbolic Significance of the Tarot Garden.” www.aras.org. Accessed November 15, 2017. https://aras.org/sites/default/files/docs/00050Brutsche.pdf.